The discovery of a Patek Philippe reference 1463, fresh to the market and from the family of the original owner is always an exhilarating moment. The reference 1463 is one of the most popular vintage chronograph wristwatches on the market today and is even more favored than it was at the time of production, due to its robust case proportions and oversized chronograph pushers. Manufactured from approximately 1940 to 1969, the reference is playfully dubbed "Tasti Tondi" due to its large waterproof round pushers. The two tone dial is preserved in superb condition with strong contrast between the outer silver section and the cream colored centre. It also features incredibly strong enamel graphics, with the "accent" strong and apparent above the Patek Philippe Genève signature. There are no losses to the enamel, attesting to the completely untouched condition of the dial. 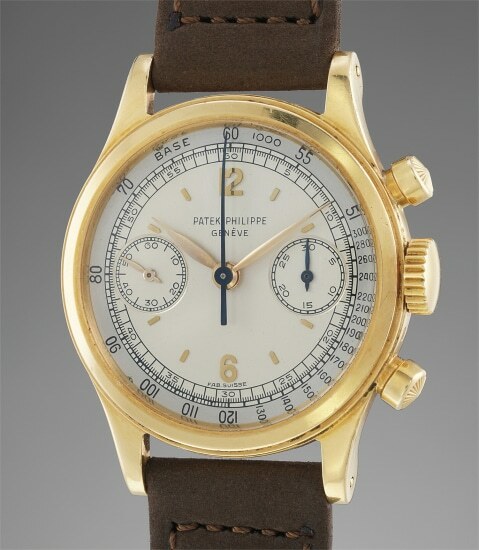 176 yellow gold reference 1463 models were known up till today and only 17 of them with a two tone silver dial. Only one other example was known until the discovery of the present watch with Fab. Suisse signature indicating that the watch was intended for the French market, this is confirmed by the JG hallmark on the caseback. JG stands for Jean Guillermin, a prominent French Patek Philippe retailer of the time. One could furthermore easily wax lyrical about the case which features two sharp hallmarks on the back of the lug and in between the pushers. The bezel retains its strong definition and even the crown remains original. The original owner of the watch was an avid traveler and the watch was most probably bought during one of his trips to Paris in the 1950s. A true barn find, the present watch ticks all the boxes that quicken the pulses of collectors: superb condition, ultimate rarity and freshness to the market.